Hey guys. 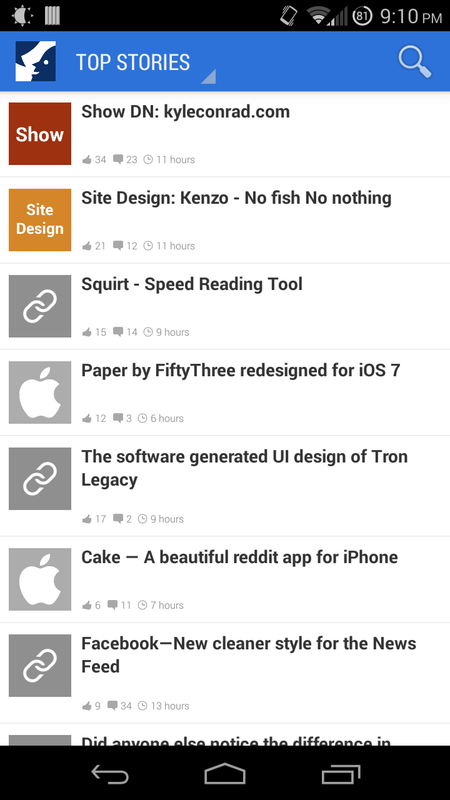 I am happy to announce an Android client for Designer News. It is available at Google Play right now. Ok, so from my perspective as an Android designer, I have some design-based feedback. Make all the icons white, #fff. Spinner menu should be holo light, not holo dark. What's the sidebar for? There's no indicator and apparently shows no content. Use the Up button. It's there for a reason. Icon needs to be a silohuette. If I have some time later I'll do a mockup or two. This is a good base but needs development. Wow! Thank you for the feedback! Yes. I agree that there are a lot of rooms to improve. Make all the icons white : I actually planned it as all white, but when I tried default icons from android (which has some transparency) , I thought it looked okay and left it there. but yes I gotta try that. Spinner menu : hmm wouldn't the white background on top of white background look bad? Search field : Okay! spinner didn't show up on my device. Thank you! Sidebar : Forgot to take it out :/ was gonna use the sidebar for navigation, but was not needed. Maybe I will use it to display MOTD later. Up button : Seemed like it was not appropriate for this purpose. I think the purpose of the up button is for going back to previous Activity. Since the components of the app is all on the same screen. I think it might misguide some users. I did use up button for search results though. Silhouette: hmm okay. I think it will help the little icons look cleaner. Thank you again for taking your time to give feedback! Really helps! Icons: great. Just need to be white assets with no borders and no transparency. Spinner: nope, it shouldn't do. Take a look at how Google do it in the Google+ app, or in the Google Play Music app. Sidebar: cool. 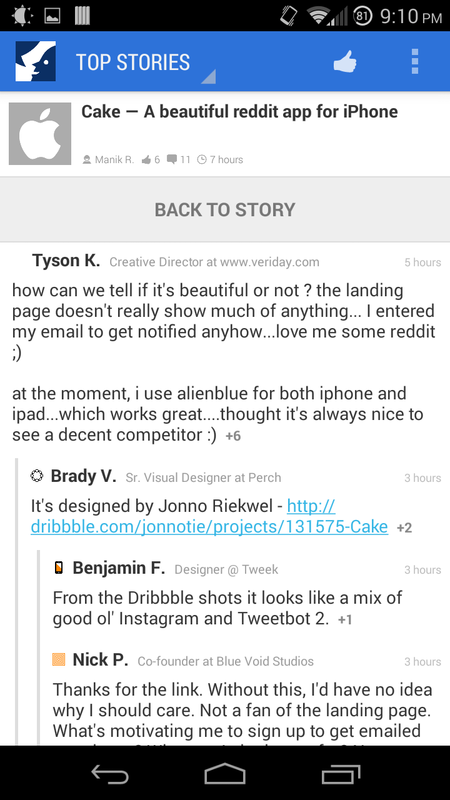 You could use a sidebar on the other side for notifications later. Up button: it's usually used for going 'up' to the previous Activity, you're right, but in the past it's also been used for going back to the previous interactive element. Up to you whether you use it. Silhouette: throw the icon in the Launcher Icon generator and it should spit out a silhouette'd icon ready for use in the app. This better be a joke. Of course I break the glass on my N4 the day BEFORE a DN app comes out. Can't fault your math there. I ended up upgrading because the home button on my iPhone 3GS wasn't responding. Nothing wrong with skipping a generation ... or 3. Ah man the 3GS... I was rockin' the original iPhone as a temporary phone one time... came a long way. How do you like the Nexus 5 I feel like the Nexus 4 was big already? Absolutely love it. Yes, it's a bit too big, but it's also really big. So while you need to learn to deal with that, it makes it so much nicer to read stuff on it. Crazy. Other than that, I can't really compare it to anything recent, as I've only had that 3GS. However, 3 of my colleagues went from N4 to N5 and they're pretty crazy about it too. Such a light, slim device. I need to stop drooling now. Really nice - I like the way you handled comments a lot. I noticed that comments that have images embedded do not load properly (they use the "placeholder square" image). Since it appears you are using Html in a TextView - you will want to add an ImageGetter (something like this: https://gist.github.com/Antarix/4167655) that will let you render images. Thank you so much for creating this! It looks amazing and works really well. I only have one suggestion. When I first clicked on a link I didn't see the progress bar letting me know how long its going to take to load the page. If you could make the progress bar just a little bigger or make it stand out more that would be awesome! Other than that its amazing! Thank you! Okay! I will make it a bit bigger. I wanted to try a progress bar which also serves as a divider between two views. but I guess it doesn't work well. I will make it larger on the next version, and if that doesn't work for users, then I will make a progress bar that appears then disappears. Nice work, love the integration of the avatars and upvotes in the comments! I'm not an Android user myself but this looks solid. Nice work Kim, we added it to our things page. Nice job! I just installed it. It works great on my phone. My only criticism (hopefully constructive) would be to make the launch icon more "Android-ish". Not sure what the technical term would be for this lol. The icon just looks out of place with all my other apps. Great work. 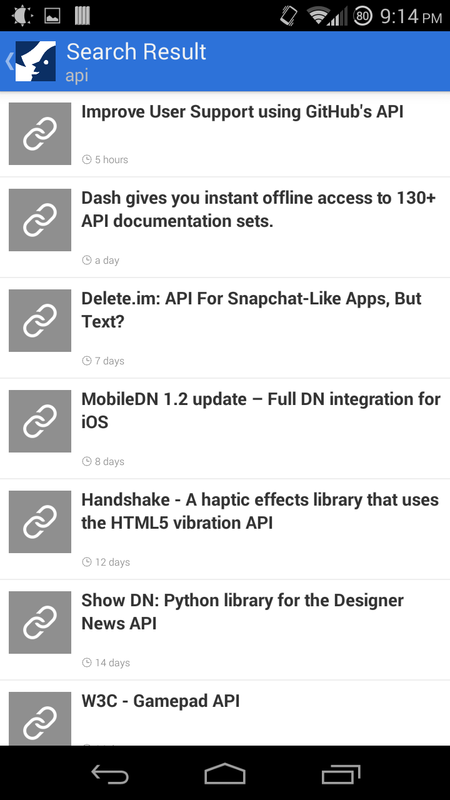 This is the first DN Android app that I actually use. The apps I've tried in the past just never worked for me. I'll share my input as well if you don't mind. Could the comments be activated on scroll? It would just eliminate the extra step of physically tapping to view. 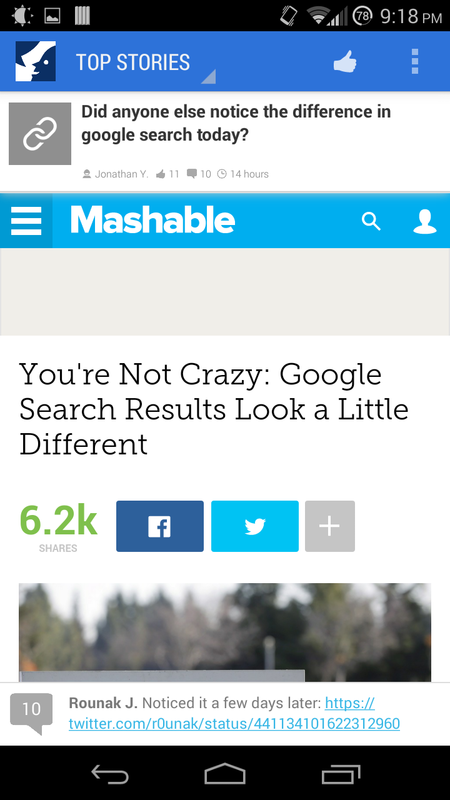 This is just an idea to throw at you, but the ability to swipe from right-to-left to navigate from Top Stories - Newest - Search. Oh, also an easily accessible sharing button so it's easy to share to Feedly, Pocket, Twitter, etc..
Great work though. Loving the app. I've been using Reader regularly, however over the last week with Top Stories I just get the eternally spinning loader now, Recent is still okay. Restarts and reboots have no effect.